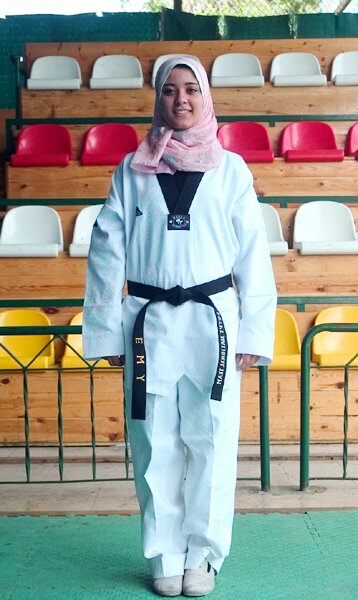 Sultan followed in the footsteps of Tamer Salah who took the bronze medal in taekwondo in the 2004 Athens Olympics. But Salah failed to pick up anything in the men's world championship which took place simultaneously with the women's. Sultan, however, made up for the deficit, proving anew that Egypt is far better in individual rather than team sports. Mahmoud and Mohamed, were national champions in taekwondo. believed in my abilities and this gave me strength and confidence," Sultan said. her participation. She was chosen for the 2004 Athens Olympics but, again unlucky, injury stopped her in her tracks. in preparation for the big one: the world championship. "It was my dream to be able to collect a medal and now to take part in the 2008 Olympic Games in Beijing." her a lesson instead of giving her a chance to win by default and I did." Sultan won 7-5.
continued after beating a Brazilian 6-3. But Turkey's world champion, Zeyner Marat, proved too much. First place went to Korea's Kim Bo-Hye as Korea collected all the women's gold and almost all of the men's. Sultan was happy all the same. "I am thrilled. I trained very well and I was lucky to get a medal without injury." she keeps on training hard, I think she will be able to do something in Beijing."